This is the first swap for 2012 at NNC. My partner was Usha who is an expert at crochet and this is her first attempt at sewing a bag.....and she hand-sewed this very pretty draw-string bag. Furthermore, she also embroidered the two hearts (using the chicken scratch technique) and appliqued it onto the bag. Besides making and sending the bag to our partners, we have to fill up the bag with stash which we think our partner would like to have, and Usha sent me some very nice stash which I definitely can use! Thanks, Usha! 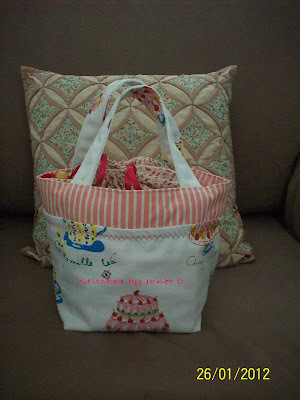 In return, I made this bag for her. I followed the tutorial here.